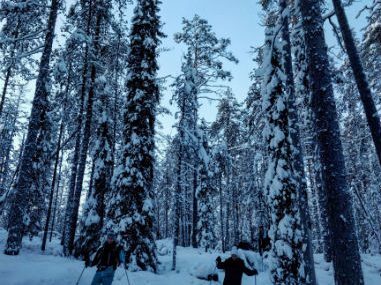 Here´s a little update on how it has been to engage in all the fun winter activities in Hossa after a while. Living with the rhythm of the seasons and having a huge contrast between them is such a richness; always different things to do and changing things see out there. 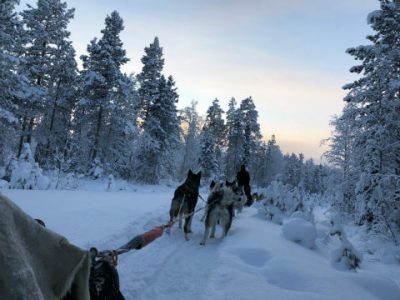 Last year ended and the beginning of 2019 started with a bunch of Dutch people and a group of German visitors willing to experience the northern winter with us, doing three separate snowshoe hiking days, a trip with the sled-dogs and some local activities like ice-fishing and feeding the reindeer on our farm along the week. Winter always comes about the same time up here, but every season is slightly different and variation does occur. 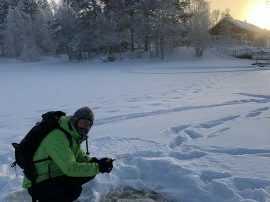 This time a thick enough layer of snow for discovering the wilderness by snowshoes came rather late, but it was possible from Christmas time onwards. 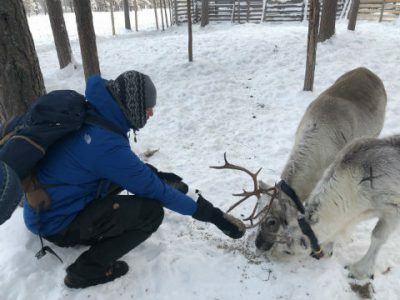 We didn´t have more than around ten reindeer being fed home early this winter, as they are well adapted to the north and a little snow doesn´t prevent the animals from getting most of their food from nature. 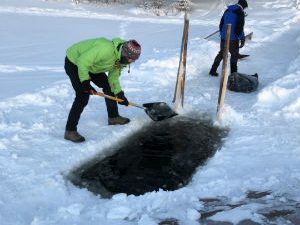 Lakes had been well frozen from November onwards already, so it was possible to walk across the lakes too even though there still was some slushy snow on the ice in some areas until the end of January. 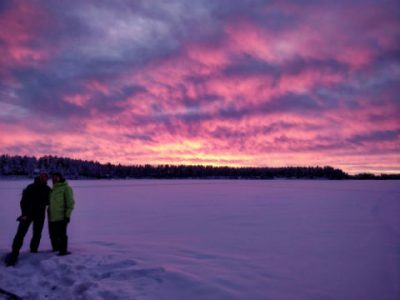 Winter showed it´s harsh side for us right from the start during our five to six hour days spent outdoors, as some times the temperatures dropped to almost -30 Degrees Celsius. Gladly with proper clothing and staying on the move, the dry cold without wind is not an insurmountable problem. Actually many times it ends up being one of the highlights of the tour for many as it was now; pushing your limits, stepping out of your comfort zone and exposing yourself to completely new conditions often leads to new realizations of one´s own capability, attitude/reactions and makes the experience totally pervasive on many levels. Another plus side of the cold is that it creates beautiful light conditions and makes the surroundings look exceptionally amazing, as all the trees are covered in sparkling frost and the views can change from pastel blue sky and golden sunlight during the day, to shades of deep purple and pink in the afternoon. During the cold times the sky is mostly clear and this means that the chances to see the Aurora Borealis are also at its best. 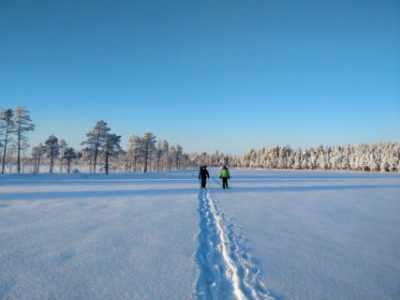 Besides the physical winter activities and the great setting we have for them, one of the main appeals of Hossa as a destination for many is the feeling of distancing yourself from the modern world, as the area itself is remote and does not have big crowds of people. 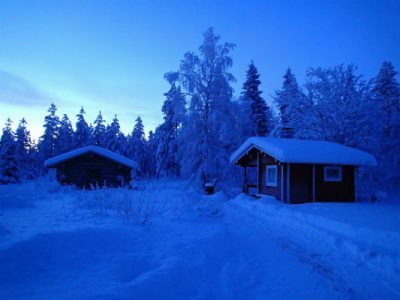 Other major thing that helps to create this back to basics-sensation is that we spent three nights in rustic cabins during our guided weeks, with zero distractions or man-made sounds that our lives are so full of nowadays. 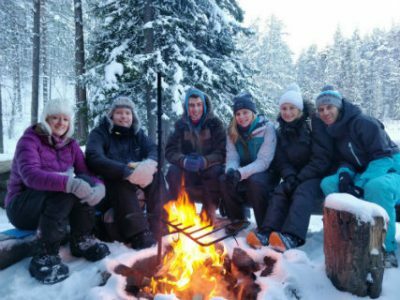 This combined with having lunches and spending time by the fire, walking through pristine protected nature with varying views and enjoying the warmth of the Finnish wood-heated sauna after cold winter days spent outside, is likely to create a fully comprehensive breakaway from the daily life back home.